A job at De Rooy means daily work with passion in order to enhance our transport. We constantly search for dedicated professional workers with enthusiastic attitude to performing their responsibilities. We seek people who would guarantee and support the quality of the services we provide. If you can see yourself in this role but you have no experience in C+E transport, it is not a problem for us at all. 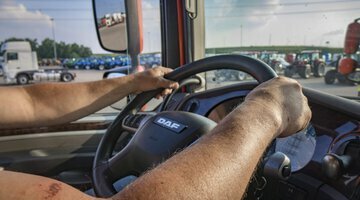 As a truck driver of De Rooy, you will begin with an intensive, a few weeks long training course. After that you will be able to set off to your route with a dominating feeling of self-confidence. If you are interested in that, check whether we have a job for you. In this position you are often on the road. You are responsible for collecting and delevering loads between Westerlo and Zeebrugge. As a fleetmanager you have a very versatile job. You are responsible for the transport planning and coordination of the drivers' work. As an international / Benelux driver you load, transport and unload trucks, tractors and / or agricultural vehicles. Based on your driving schedule, you deliver vehicles to our customers throughout Europe and even beyond.